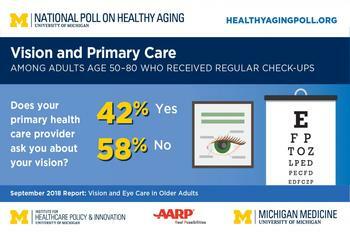 A University of Michigan-AARP National Poll on Healthy Aging indicates that primary care providers (PCPs) could do more to promote eye care for people over the age of 50. The poll of 2,013 adults, ages 50 to 80, was conducted by the University of Michigan Institute for Healthcare Policy and Innovation, and it shows that 18 percent of respondents have not had their eyes checked in three years or more. Eye exams are one of the most effective methods of identifying eye disease and preventing vision loss. During Healthy Aging Month this September, Americans over 50 are encouraged to have their eyes checked. "Vision loss affects an older adult's overall health, risk of falling, social interactions, and quality of life," says Alison Bryant, Ph.D., senior vice president of research for AARP. San Diego Center for the Blind offers several innovative programs for people living with vision loss. Please contact us to learn more.